Can high self-control have drawbacks? Extensive research has shown the lifelong benefits of self-control for important outcomes such as education, health, income, and happiness. Far less work has been done on its potential negative impacts, where an overwhelmingly positive trait can end up having a less than positive effect on behavior. Recent research suggests that one such side effect may be an increased susceptibility to illusory control (IOC): in situations where actual control is limited but the potential for illusory control is high, high self-controllers may end up being more prone to overconfidence than low self-controllers, and this susceptibility may play out in suboptimal risk-taking behavior. Here, a series of five studies tests this causal chain, exploring the links between self-control and illusory control and the resulting impact of the relationship on risky decisions in the financial domain. In studies 1 and 2, high self-controllers consistently underperformed low self-controllers on two tasks of risk-taking, the Columbia Card Task and the Lottery Gambling Task. These effects persisted both under stress and in normal conditions. Individuals high in self-control failed to learn as well from negative feedback and were more prone to overconfidence, leading us to posit a causal mechanism rooted in the illusion of control, and specifically, in the positive affect that accompanies it. Studies 3 through 5 proceeded to test this relationship directly, on a decision-making task that looked specifically at financial risk-taking, the Behavioral Investment Allocation Strategy (BIAS). Across the three studies, we validated our findings from Studies 1 and 2 in the new risk-taking task, by showing that individuals low in self-control consistently outperformed those in high self-control by making more optimal choices and fewer errors throughout the game. We next tested the precise causal mechanism of the observed decision making patterns by manipulating IOC (Study 3), positive affect (Study 4), and perceived self-control (Study 5). We found that inducing IOC increased the number of errors committed by both high and low self-controllers across the board: individuals in the IOC condition made fewer optimal choices and performed worse overall, confirming our suspicion that IOC can be responsible for sub-optimal choices on financial risk-taking in stochastic environments. However, because the effect was non-selective, the precise causal mechanism and its relations to self-control still remained to be determined. In Studies 4 and 5, we were able to disambiguate the mechanism behind the underperformance caused by IOC. Specifically, we demonstrated that inducing positive affect (Study 4) reduced the number of optimal choices for low self-controllers on the BIAS task, making them look more like high self-controllers in their decisions. Surprisingly, the induction actually improved performance by high self-controllers. The perceived self-control induction (Study 5) also had a differential effect on high and low self-controllers. It decreased the number of optimal choices made by low self-controllers, again making them look more like high-self-controllers--but, just as with the positive affect induction, it increased the number of optimal choices made by high self-controllers. The increase in positive affect that accompanied the self-control induction was a significant mediator of the effect, a mediation that held when we pooled data from all three studies into a single affective mediation analysis. 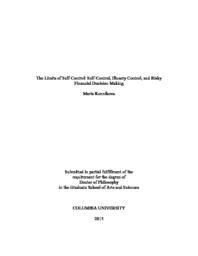 The induction results for low self-controllers confirm our hypothesis that the positive affect that usually accompanies both the illusion of control and high self-control can be an Achilles heel of high self-control in certain environments with limited actual control, creating a feeling of overconfidence that translates into suboptimal decision making. We explain the surprising improvement in performance of high self-controllers under induction conditions, as compared to baseline, by the higher self-reflection ability that accompanies high self-control. Specifically, a situation that is normally "hot" for high self-controllers is cooled through an induction that draws their attention to their high baseline self-control and accompanying positive affect. As a result, they reflect on their choices to a greater extent and act more in line with their usual optimal decision making ability. We thus both identify a specific environment where high self-control can prove to be a limiting factor for optimal decision making, and suggest a possible way to remedy that limitation, by providing a cooling period and drawing the attention of high self-controllers to the reasons for their sub-optimal strategy (namely, their positive feelings and high opinion of their own self-control). Together, the findings provide tantalizing implications for the sub-optimal market choices that even the most intelligent and successful individuals will make under the right conditions--and equally tantalizing ways to make those choices more sound.